The laws are intended in part to act as a deterrent to criminal acts. But laws lose all deterrent effect if the criminal-wanna-be KNOWS that no one knows the law AND/OR the law will never be enforced against them. Such is the dilemma we find our sad selves in now with the police, lawyers, politicians, public servants and more. “They” have operated SO LONG with impunity because no one enforced the rules against them that they are literally in a criminal free-for-all. Like misbehaving children with guns they need a time out, be grounded and in some cases spanked. This applies to every “public/civil servant” who does wrong…. including those who do not report their fellow workers who are engaging in rules breaking and criminal acts. You are an accomplis if you do not actively speak out to help stop it. You are the first, best witness to the crimes and your silence binds you to the guilt for the crimes. The “superiors” who encourage lawless behaviour by not acting to enforce the internal policies and rules, never mind the rule of law, carry the greatest burdon of guilt and responsibility because your actions CAN stop such behaviour, but you choose not to. Your inaction actually encourages more lawless behaviour by your charges. So it falls to the private citizen to stand alone against the irresponsible, bureaucratic leaders, criminal agents and corrupted legal system. That’s a real old story…who is tired of it? Maybe it’s time to get serious… a whole bunch of us? The truth is publicly acknowledged that “they” investigate and enforce the laws against each other in the VERY rare instance when the crime goes public enough that “they” have to pretend to enforce the law….which then gets dragged out over a long period of time hoping that time will wear down the injured party and fade the problem from public consciousness. Usually it works. Sometimes not. Sometimes people actually tenaciously hang on against “the machine” and win a settlement, sometimes in court so there is a record, other times the victim gets an offer in private so “they” can sweep the cruel truth under the rug and not be publicly found guilty. We need to remember “they” are not a machine but a group of individuals with hopes, dreams and fears just like us and they FEAR being exposed and they FEAR being prosecuted, even if their fear of prosecution is tempered by knowing that they will be protected and even if found guilty only get a slap on the wrist for their crimes. Very few are really “evil”, many may in fact be zombies but many are just average folks trained to servitude and chained to a mortgage dreaming of that VERY generous pension, with whatever perks along the way. Crime does appear to pay if you are “in the system”. We need to up the ante and make them feel the fear they falsely put on us by reclaiming the position of masters OVER our public servants and prosecute every infraction. No other action will wake up and create changes in the behaviours of our wayward servants. I guess that means we need to practice being the boss/master to them and not continue acting like we are the slave/servant to government. Every government actor is fully liable and suable when they fail to act within the rules of law and their legislated authority. But they must be sued in their personal capacity. Every PUBLIC SERVANT/ CIVIL SERVANT is ONLY protected from prosecution or civil liability IF they do their job within the boundaries of their “office” (hey, are those different legal capacities or legal systems – one serving people/public and the other serving the civil law defacto government???) . If they DO ANYTHING outside their permissions/ policies/ legislation/ law/ mandate or rules they are considered to be acting NOT as an “officer”, with full protections and full immunity but in their personal capacity with FULL LIABILITY, NO legal protections and you can sue ’em. It is to be noted that the appellant chose to proceed against the Attorney General in his official, rather than personal, capacity. In her factum, the appellant also maintains that all of the respondents were acting, “at all material times” as agents [which means not in personal capacity] of the Attorney General for Ontario, who “acted as an agent” of Her Majesty the Queen in right of Ontario. For the purposes of Rule 126, as McIntyre J. has indicated, we must assume that all the facts alleged by the appellant in her submissions are true. The question then, to be decided before the matter is allowed to go to trial, is simply: does the appellant’s claim disclose a reasonable cause of action? [the claim by the “victim” was… at all times he acted WITHIN his office… where he has full immunity for his actions….so no valid cause of action] This is a pure question of law, and no evidence is required for its determination. In fact, there is every advantage, in terms of saving the time and cost of a trial, to decide a question of law at the outset. This, in fact, is the very reason for the existence of Rule 126. …..immunity from civil suit enjoyed by Attorneys General and Crown Attorneys is absolute when they are acting within the bounds of their authority. ….. It has been pointed out that the Proceedings Against the Crown Act was passed to give citizens the right to sue the Crown for the tortious acts of its officers and servants. The Act also prevents suits against the Crown for acts of its officers or servants carried out in the due enforcement of valid legislation. The Act was not designed, however, to protect the officers and servants of the Crown personally from actions arising out of torts committed by them against members of the public, whether during the course of their employment or not,which were not done solely for the due enforcement of the criminal law or the provisions of any act of the Legislature…. Per Rand J.: To deny or revoke a permit because a citizen exercises an unchallangeable right totally irrelevant to the sale of liquor in a restaurant is beyond the scope of the discretion conferred upon the Commission by the Alcoholic Liquor Act. What was done here was not competent to the Commission and a fortiori to the government or the defendant. The act of the defendant, through the instrumentality of the Commission, brought about a breach of an implied public statutory duty toward the plaintiff. There was no immunity in the defendant from an action for damages. He was under no duty in relation to the plaintiff and his act was an intrusion upon the functions of a statutory body. His liability was, there-fore, engaged. There can be no question of good faith when an act is done with an improper intent and for a purpose alien to the very statute under which the act is purported to be done. There is a course on this website Hope For Justice:In Action- Your Complaint IS Their Restraint which is the third course in the series. This course is all about understanding and reclaiming your proper place as a man/woman in common law, the authority OVER “them” and to know you can complain and how to formally make complaint against the illegal acts of public officials and other government actors. But before we sue them we need to be honorable, exhaust our private remedies and give the offending party the opportunity to remedy the situation in private. Once they fail to do so then we have not only the right to sue but the proof of their agreement to their criminal actions. That process is covered in the second course in the series Hope For Justice: In Action here on this site teaching the proper action we need to take FIRST using the lawful concepts of honour/ dishonour and conditional acceptance. Of course if you, like many, believe the courts are corrupted and system broken beyond hope you might be served by viewing the first course Hope For Justice where example after example are explored to show that the courts can act lawfully when we do the right things to ensure it. People inside the system have corrupted the system but the courts can work lawfully when we undertand how force them to. Without us taking action and suing for remedy we give permission for them having done it to us and permission for them to continue doing to others. And yes, you CAN win. We each need to know that there is Hope For Justice in the court system and we need to know how the process of dealing with a matter privately is the first and most honourable step, followed by knowing how to make a legal complaint, if the offender does not remedy the matter in private. All the steps are needed to be undertaken and followed through with by MANY private people…..to make the change we all want to see. I know what you want to choose….will you? How about a fresh over the newswire example of “insiders get off with a slap on the wrist”. Would you be treated this way??? An off-duty Edmonton police officer who was caught driving with alcohol in her blood in Saskatchewan was able to walk out of court without a criminal record. Sgt. Cheryl Wallin had open alcohol in her SUV and a blood alcohol level that was twice the legal limit — but she left a Humboldt courtroom with an absolute discharge. The incident took place in July, 2010. While off duty, Wallin was pulled over by RCMP on the highway outside Lanigan, Sask., according to records recently obtained by CBC News. Other drivers had reported an SUV swerving across lanes and onto the shoulder near the town, which is about 125 kilometres east of Saskatoon. Wallin, who’s spent 23 years on the Edmonton force and has 15 awards and commendations, was charged with impaired driving. Last year, she went to court in Humboldt. There, she pleaded guilty to a lesser charge of dangerous driving and was given an absolute discharge, which can leave an accused person without a criminal record. CBC asked the Saskatchewan Justice Ministry why Wallin was not tried for impaired driving, but did not receive a reply in time for this article. Meanwhile, Wallin’s actions also resulted in internal discipline under the Alberta Police Act. She pleaded guilty to discreditable conduct under the act and was suspended without pay for two weeks. The PIVOT Society does good work in Vancouver helping low income people protect their rights check out their website and download their “How To Sue The Police” handbook. If you need information about your rights when dealing with a private security guard or want to make a complaint against a private security guard check out www.securityandyou.ca for more information. Police complaints are allegations of misconduct and you as a citizen have the right to file a police complaint. When someone files a police complaint against a police officer an incident report is placed in the officer’s record, so as to hopefully keep the officer from continuing to abuse his or her authority. It also makes the officers superiors aware that there might be a problem with an individual police officer that needs to be addressed. Filing a police complaint and reporting police misconduct is a step towards ending this abuse of power by police. Police complaints will not get a victim compensated for police abuse. Police complaints are not law suits. If you file a complaint against a police officer and the police clear themselves as they often do, the only recourse you may have is a civil law suit. A civil law suit you may receive compensation if you and your attorney can prove damages or civil rights violations. Contact a competent civil rights attorney if you need more information about filing a law suit for civil rights violations. To file a complaint on a police officer “one of a less serious nature,” you need to send a written complaint “certified mail with return receipt.” You can send the police complaint to Internal Affairs. Certified mail gives you some type of proof that you actually filed a complaint against a police officer. If you don’t send the complaint certified mail the letter sometimes gets lost or misplaced by someone at the police department. As soon as possible write down everything that happened. Don’t worry about sending your complaint off right away. Wait a few days and go back over your written complaint and see what you might have forgotten the first time you wrote it. There’s no need for “emotions” to be involved, when you write your complaint and the most important thing is to be truthful! If the police catch you in a lie, your complaint won’t be credible nor will any other complaints you send in the future. You could even be charged for making a false report against a police officer and in some states be sued. Do you have corroborating witnesses, whose story does not conflict with yours? If you have witnesses you should ask each of them to write a separate account of the incident. Do you have any type of evidence, like pictures or a video recording? If you do, don’t send the “original” to the police, send only a copy. Mail the complaint “certified mail with return receipt requested,” to Internal Affairs at the police department or the sheriffs department where the officer works. The complaint will be investigated and you should receive a letter back from the police agency on the status of your complaint. Most police complaints will be in the favor of the police officer, but the good thing is the complaint will stay on the police officers record. The police may try and contact you by phone or mail to do a “follow up” about your complaint. Don’t answer any questions and never go down to the police station for an interview. Tell them everything they need to know is in your letter you sent and then say good bye. Stick to what you said in your complaint letter and say nothing else! There is a time limit on how long you have to file a complaint against a police officer. For minor police misconduct you may have only 60 days and up to 6 months for more serious allegations. If you’re interested in knowing what complaints have been filed against police officers in your community, you may request a copy of that information be sent to you from that police agency. Send your request “certified mail with return receipt requested.” Request a copy of complaints of police officers from that agency be mailed to you under the “Freedom of Information Act.” DON’T ever walk into a police station and ask for this information! 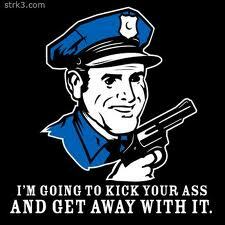 Police officers either start acting real stupid on the subject or they get mad and start threatening you. Never file a complaint directly with a police agency specially if the complaint is of a serious nature, see an attorney! If you do plan on hiring an attorney, get one who doesn’t work in your area. Don’t get a lawyer from your town, county or from the surrounding counties. Local lawyers work with same judges, prosecutors and police officers on a daily basis and may not want to win your case as bad as you do. You may also contact your State Attorney General. For serious incidents call the ACLU hot line 1-877-634-5454 or contact the Department of Justice Click here for the (DOJ) site. NOTE: The FBI is the lead US federal agency for investigating color of law abuses, which include acts carried out by government officials operating both within and beyond the limits of their lawful authority. Off-duty conduct may be covered if the perpetrator asserted his or her official status in some way. yes – and they will continue to until we complain officially and legally.